This episode of CommerceTomorrow has been recorded live at the Shoptalk conference 2018 in Las Vegas. Dirk and Kelly talk to Zia Daniell Wigder, Chief Content Officer of Shoptalk Ventures. She talks about the beginnings of the show, which in its third year pulled an audience of more than 8,000 people. Zia also discusses how to attract and present a premium line-up of speakers and make sure that retailers, system integrators, and software vendors are on equal ground and all benefit from the conference. 00:23 Dirk: We have another special guest with us from ShopTalk, with us is Zia Daniell Widger, Chief Content Office of ShopTalk ventures. Before we dive in, please tell us a little more about you. 00:46 Zia: I joined ShopTalk at the very beginning, prior to our official launch. I spent 7 years at Forrester running the global omnichannel research. I thought that in many ways ShopTalk would be similar to what I was doing at Forrester. 1:30 Kelly: That’s interesting. It’s really remarkable how ShopTalk has become “the” show for commerce. How did that happen? What’s your recipe for success? 1:52 Zia: These guys (Jon and Anil) have done it before and they very successfully scaled Money 20/20. What intrigued me was doing this for retail and ecommerce. My initial reaction was the last thing this industry needs is one more even but, after learning more about the vision, I realized the industry really needed this. They have successfully brought together all parts of the ecosystem, which is something no other event has done. The idea here was to bring together the venture backed companies still in early stages along with traditional brands and retailers and investors all on one site the whole time to learn from each other. We wanted to bring together this community that didn’t exist. 3:20 Kelly: It’s remarkable. We like it because it’s the only show where we feel on par with the brands and other retailers. With other events, even if we’ve dropped a couple thousand dollars on a show, we still feel like second class citizens. 3:38 Zia: We felt like the relationships between the brands, retailers and tech companies was really broken. This was one of the things that we strived to address with ShopTalk. We made everyone on par as far as access to the event. We don’t do pay to play but we do have tech companies on the agenda. It’s the tech companies that are leading the charge. We wanted to create an event where everyone is on equal ground. 4:23 Dirk: Absolutely, I couldn’t agree more. This is probably the reason how you differentiate from other events. The success speaks for you. Maybe you can share some key numbers? Kelly and I have been here since the beginning and have really seen the growth over the last 3 years. 5:00 Zia: Our first year, we aimed to have 2,500 people and we got a lot of amused smiles when we shared this because we were a new event. We actually had 3,100 people the first year and it was really remarkable that we surpassed that goal. Going into year two, things started to accelerate. We moved to the entire Aria and ended with 5,600 people. Everyone asked how we would continue to scale. This year we had the goal of 7,500 and ended up getting 8,500. We didn’t know if we would reach it or not but we're thrilled by the turnout. We had a much bigger international audience this year also. One of things I’ve really worked on it making the content broad and relevant to everyone, whether or not you’re a US based company. We needed to bring in a lot of speakers. Over 60 speakers from outside of the US. We will continue with this trend so there is something for everyone to benefit from. 6:40 Dirk: You also achieved a remarkable goal of having a large amount of female speakers. Which is often a challenge but somehow you managed to get this into the right direction. 7:10 Zia: That was incredibly important to us. Women have been traditionally underrepresented so we keep a close eye on our number of women speakers. We believe that those women are out there sometimes it just take a little extra effort to find the ones you’re looking for. We ended up with 110 women on the agenda, about ⅓. Ideally, we would like parody, but we are moving in the right direction. 7:46 Kelly: How do you find all of these speakers? You have a real A list of guests here. 7:58 Zia: We built this from year one. When we started out, both Jon and Anil had deep roots in the venture backing companies so they worked with a number of VC’s. We were very fortunate to have their support and work so we worked with a number of their portfolio companies. The startups were the first round of companies we could bring on board. We had connections within that community and they tend to be a little more risk averse. They don’t have the corporate/ PR restrictions. Once we got higher profiles, we started to attract some larger brands and retailers. We had a few people who took a leap of faith when they signed on. We worked with a lot of friends of friends and after year one, we built on it. By the 3rd year, we had people approaching us who we would have begged to have on board in year one. So, everything really built on itself to get us where we are. 9:35 Dirk: Maybe let’s have a little recap on this years show. What have been your personal highlights? 9:55 Zia: I think a couple of things were interesting to me. One is that this is the first time we’ve introduced a track specific to China. Specifically, about the innovation happening in China. I was thrilled to see that there was enormous interest there. Another surprising thing was that grocery talk had such traction. We had never done a category specific track before. We thought it would be niece content. It was jam packed with people standing in the hallways and trying to get in and just see the speakers. I think this speaks to all of the opportunity in grocery, especially digitally. We were pleasantly surprised to see how many people are interested in this topic. 11:29 Kelly: You recently launched ShopTalk Ventures. Can you tell us a little bit about that? 11:33 Zia: We are doing it together with Commerce Ventures, which is an early stage VC firm in the Bay Area. The idea is to invest a million dollars over 2 years in a variety of different startups in commerce technology. With the idea being to help support the interesting initiatives that we are learning about ShopTalk. It’s a way for us to support the innovation that’s out there and bring these ground breaking companies into the community. 12:10 Dirk: You have been supporting startups since the early beginning, which is really great. Last year, you had ShopTalk Europe. What are your plans on internationalizing the ShopTalk brand? 12:30 Zia: It was such a success last year, that we wanted to come in with the most modern approach as possible. This year, at ShopTalk US, we tried so many new things. We decided that we really needed time to figure out which of those were going to be the most successful and work in Europe. We wouldn’t have been able to turn them around in a few months. So we didn’t want to risk doing a show that was already dated before we even got to it. We decided that even though this would require us to skip a year, it made more sense for us to skip a year and wait to do it really well going forward. 13:30 Kelly: We are looking forward to attending. 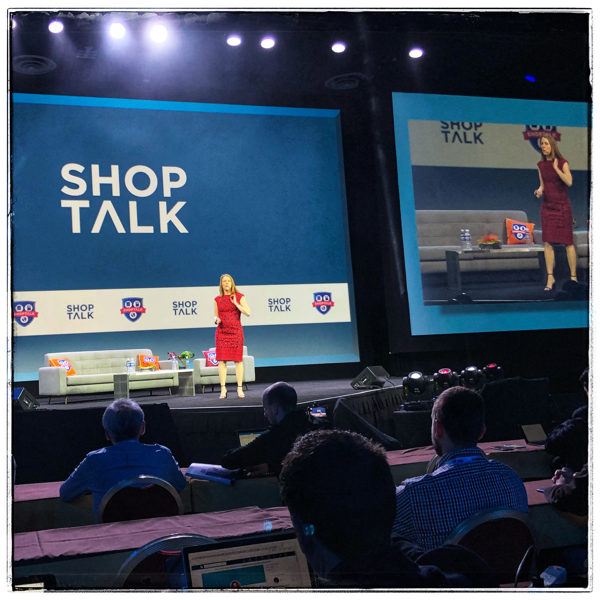 What’s next for ShopTalk? What’s the end state? 13:55 Zia: We very much want to remain a conference, not a trade show. We want to continue to have great content and attract a very senior level audience. That being said, there are a number of areas where we will continue to grow: the international component. With the success of grocery talk this year, we will continue to grow there. We are very much aware that we want to keep a community feel. 14:56 Dirk: Sounds great. From my perspective, it’s the right way to go. Everyone comes for the content. Thank you so much for your time. I know it was a very packed time for you. We wish you a great recovery from an awesome show. Hope we can have another recap next year!